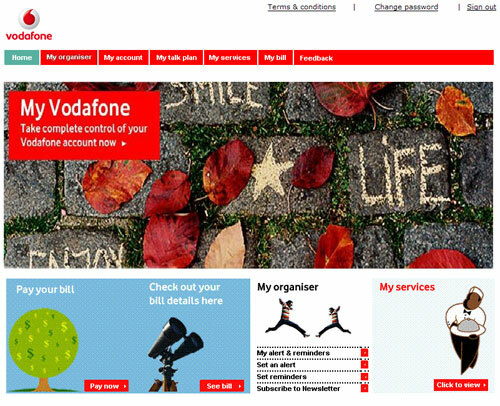 My Vodafone is a service provided to users to manage their account. This service allows you to manage the services you’ve opted for, make changes in your talk plans and get statistical charts of all your bill components. Activation: One needs to register on the site and then call up 111 to get a password. This would normally take 5 minutes, if you’re not kept on hold. Just type in the details and you’re through. The welcome you get is definitely a turn-off. The page (pictured above) is shabby with pixelated images. When we tested the service on browsers like Firefox and Opera, the layout went haywire with the links trying to make their way into the page from south. However, it worked fine when viewed Internet Explorer. 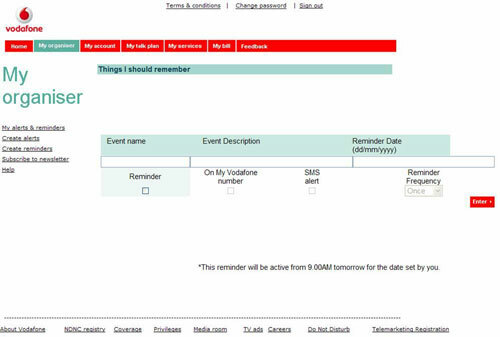 Anyways, to start off, we make our way into the My Organiser service, which allows you to set reminders (through SMS) and activate alerts, subscribe to newsletters, etc. Great way to make sure that you don’t forget your loved one’s birthday. Next we barged in the My Account area, where you get all the possible details you filled in during the registration of your number. Your account details sit here and there are arrangements to change details like your address and contact details. Great way to manage your account details. 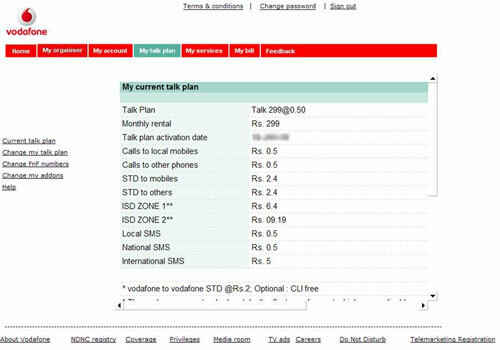 Next comes My Talk Plan, where you get access to your plan details and the charges of the same. You can also change your plan, Family and Friends numbers (the selected numbers on which you get discounted rates) and change you add-on services. The My Services area gives you the subscribed services you are using and the one’s you can activate. The charges of such services are also provided. Last but not the least is the Electronic Bill Presentment Software. This is the USP of the whole concept and it provides you with previous months bill analysis. It lets you choose the numbers you made calls to and analyse the duration independently and also as a % of the whole. It also allows you to view the data in tabular, pie and bar chart forms. You can save all this data into an Excel file for future use. This whole software is quite confusing for a normal person and with no “Help” option, you are on your own. We Say: The appearance is quite disappointing and one of the world’s largest telecom player could have done a better job. The usability and interface could have been more user friendly for the normal Indian. There’s a high need for the Help option to guide the user to the data he wants to acquire. We would rate the service 2.5/5. Try out the service here.